Once thought to be extinct. In recent years, due to new importation from Turkey, the breed's country of origin, the Turkish Angora has again taken its place in the roster of the pedigreed cats of the world. The first known longhaired cat, they are highly regarded in Turkey as part of their national heritage. Many people have used the term Angora to signify any longhaired cat. 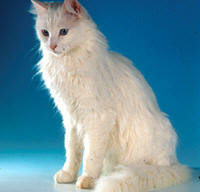 However, the only pedigreed cats that carry the name "Angora" are the Turkish Angora. In the early part of the 20th Century, the Angora was used indiscriminately in breedings with Persians, finally disappearing from the scene as it became incorporated with that breed, known for a time simply as Longhairs. The Turkish Angora is a pure, natural breed of cat, originating probably from the Manul cat domesticated by the Tartars. They migrated eventually to Turkey, where they are regarded today with great reverence as one of their national treasures. In 1962, the Angora was rediscovered by American servicemen in the Ankara Zoo in Ankara, Turkey, in a controlled breeding program dating back forty-five years. CFA only accepts for registration those Turkish Angoras whose ancestry can be traced back to Turkey. Turkish Angoras make wonderful pets. The Turk is a quick-witted, quick-moving, and sometimes quick-tempered cat. They are among the most intelligent of the cat breeds. They love their owners with a single minded devotion. They are long, elegant, finely boned creatures with smoothly pointed faces, who adore running and playing with wonderful grace and a great zest for living. Their single, silky, medium length coats need only occasional grooming to look good. The males are the better pets, being even more intensely loving than the females. They often learn to fetch and do tricks. However, what they enjoy best is sitting on the lap of their owner to love and cuddle. They are not above manipulating their owners to get what they want. A Turk can teach you to play fetch, to turn on the faucet when she wants a drink, or to child-proof all your cabinet, those narrow little paws can be amazingly agile. The hallmark of the Turkish Angora is refined, athletic grace. Come home from work, and be greeted by a Turk leaping to your shoulders, purring, with not a claw out of place. Make dinner, and watch a Turk make a 9-foot leap from a standing start, to the top of a cabinet - and make it look easy - to supervise their human... "Is that salmon for dinner?" Eye Colour can be amber, blue, or one eye of each colour. Unfortunately, as with other white cats, a significant proportion of these cats are deaf; this handicap can be a serious problem, especially for potential owners living near busy roads. Oddly, the deafness is usually confined to the blue-eyed side. The Turkish Angora is now generally available in a full range of colours, having been accepted by CFA in any shade and pattern, except those that denote hybridization such as lavender, chocolate or the pointed pattern. They occur commonly, in most solids, tabbies, smokes and parti-colours. White is still the most popular colour, though this is rapidly changing, as more and more breeders realize the beauty of this elegant breed in a variety of exciting shades. The coat is medium-length and fine, with a silky sheen and a tendency to waviness on the underparts. There is no fluffy undercoat, which makes the Angora easier to groom than a Persian cat. Angoras tend to moult rapidly and heavily in the summer, replacing their coats with equal rapidity when Autumn comes. Solid colours include black, blue, cream, and orange. Bi-colours are Predominantly white with patches of one other colour. Tortoiseshell or Calico are a patchy pattern made up of three or more distinct colours (usually black, orange, and cream/white). Tabbies are a darker stripy pattern on a lighter background colour; found in silver, orange, brown, blue, or cream. The adult coat is not fully developed until the cat is two years old, and may even take up to five years to develop fully.